The worst thinning is above middle latitudes, where most people on Earth live. If you grew up in the 70s or 80s, you probably heard a lot of talk about cholorofluorocarbons, AKA CFCs — chemicals used in aerosol sprays and refrigerants. That’s when we first figured out that CFCs could harm the ozone layer of our atmosphere. Suddenly, overly-hairsprayed styles from the 1980s seemed much less cool. Then in 1987, nearly 200 nations signed the Montreal Protocol, which banned CFCs. The aim was to limit the widening of a hole in the ozone layer located above Antarctica, and that global effort was implemented during the following decade. Fast forward nearly 30 years. 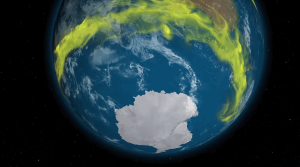 The Antarctic ozone hole has become manageable. The Montreal Protocol has been a success, helping reduce some 135 billion tons of carbon dioxide emissions between 1989 to 2013. CFCs, it turned out, were actually greenhouse gases too. But recent evidence from a study published in the journal Atmospheric Chemistry and Physics suggests that ozone levels in our planet’s lower stratosphere have been decreasing, especially in the mid-latitude areas where most people on Earth live. Researchers suspect that so-called “very short-lived substances” (VSLSes) that contain chlorine and bromine are the culprits behind the ozone decrease. ETH Zurich atmospheric physicist William Bell, who led the study, told Futurism that the Montreal Protocol isn’t to be blamed here. The 1987 deal didn’t include VSLSes among its list of banned chemicals, mostly because these chemicals are supposed to have very short lifespans. Scientists didn’t expect they could subsist long enough to reach the stratosphere. Apparently, they can. Worst of all, climate change could also be a factor: Bell and his colleagues think that climate change has been sweeping ozone out of the tropics. In mid-latitude areas, the ozone layer is already thinner, and people are more exposed to ultraviolet rays. Lots of questions remain unanswered. What’s keeping the ozone levels thin in these tropical areas, and not in higher altitude zones? If VSLSes are to blame, how are they ending up in the stratosphere? And finally, what’s the best way to address these issues? The world may need a new iteration of the Montreal Protocol, one that bans other ozone-depleting chemicals like VSLSes.